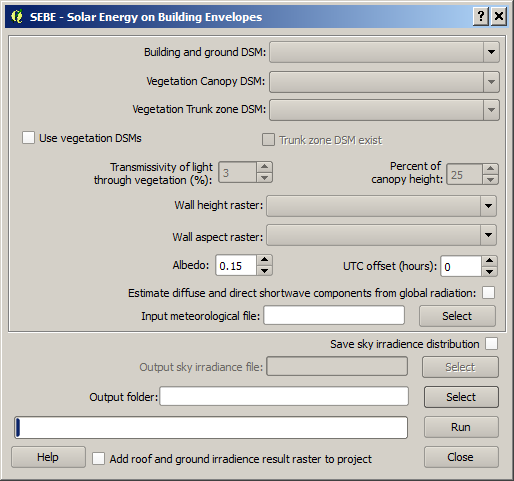 The SEBE plugin (Solar Energy on Building Envelopes) can be used to calculate pixel wise potential solar energy using ground and building digital surface models (DSM). SEBE is also able to estimate irradiance on building walls. Optionally, vegetation DSMs could also be used. The methodology that is used to generate irradiance is presented in Lindberg et al. (2015). A DSM consisting of ground and building heights. This dataset also decides the latitude and longitude used for the calculation of the Sun position. A DSM consisting of pixels with vegetation heights above ground. Pixels where no vegetation is present should be set to zero. A DSM (geoTIFF) consisting of pixels with vegetation trunk zone heights above ground. Pixels where no vegetation is present should be set to zero. Tick this box if you want to include vegetation (trees and bushes) into the analysis. Tick this in if a trunk zone DSM already exist. Percentage of light that is penetrating through vegetation. Default value is set to 3 % according to Konarska et al. (2013). If a trunk zone vegetation DSM is absent, this can be generated based on the height of the Canopy DSM. The default percentage is set to 25%. A raster of the same size and extent as the ground and building DSM including information of the wall pixels and its height in meters above ground should be specified here. Non wall pixels should be set to zero. This raster is used to estimate irradiance on building walls and can be generated using the Wall Height and Aspect plugin located at UMEP -> Pre-processing -> Urban Geometry -> Wall Height and Aspect. A raster of the same size and extent as the ground and building DSM including information of the wall pixels and its aspect, i.e. angle, should be specified here. For example a wall facing towards the south has a value of 180°. Non wall pixels should be set to zero. This raster are used to estimate irradiance on building walls and can be generated using the Wall Height and Aspect plugin located at UMEP -> Pre-processing -> Urban Geometry -> Wall Height and Aspect. This parameter specifies the reflectivity of shortwave radiation of all surfaces (ground, roofs, walls and vegetation). It should be a value between 0 and 1. The default value is set to 0.15. Time zone needs to be specified. Positive numbers increase when moving east (e.g. Stockholm UTC +1). Tick this in if only global radiation is present. Diffuse and direct shortwave components will then be estimated from global radiation based on the statistical model presented by Reindl et al. (1990). If air temperature and relative humidity is present, the statistical model will perform better but it is able to estimate the components using only global shortwave radiation. Input meteorological data specifically formatted to be used in UMEP. This specific format can be created using UMEP -> Pre-processing -> Meteorological data -> Prepare existing data. A dataset with hourly time resolution should be used for SEBE, preferably at least one year in length. The time should be in LST for the specific location to be modelled. Multiple years can also be used to improve the model outcome. Model output is dependent on the meteorological input data so if a short dataset is used, potential solar energy would be valid for that particular time period only. Mandatory data is global shortwave radiation, but the model will perform best if also diffuse and direct components are available. where h is the sun altitude. Since diffuse and direct components of short wave radiation is not common data, it is also possible to calculate diffuse and direct shortwave radiation (see above). When the box is ticked in, it is possible to save the radiation distribution from the sky vault calculated from the meteorological file. SEBE first distributes the radiation on 145 sky patches on the sky vault and then generates shadows on the DSMs based on these patches, i.e. the core loop in the model iterates 145 times. For more detailed information on this, see Lindberg et al. (2015). A specified folder where result will be saved should be specified here. One raster showing irradiance on ground and building roofs named Energyyearroof.tif is saved as well as a text file of wall irradiance (Energyyearwall.txt). Also, the ground and building DSM is saved in the output folder to be used later in a SEBE visualization plugin (UMEP -> Post-processing -> Solar Energy -> SEBE (Visualisation)). If this is ticked in, Energyyearroof.tif will be loaded into to the map canvas. This button closes the plugin. As mentioned earlier, three mandatory datasets are save is the model was successful. The geoTIFF Energyyearroof.tif show pixel wise total irradiance in kWh. Energyyearwall.txt show total wall irradiance for each wall column. The Energyyearwall.txt is formatted in the following way: first and second column is the relative row and column number from upper left corner of the modelled grid. The following columns are irradiance for each wall voxel starting from the ground and moving upwards as going right in each row. If zero values are found (especially in the end of the row that means that the wall column has reached its maximum height. The column voxel is decided based on the pixel resolution of the input data. Also, the ground and building DSM is saved in the output folder for later use. If the vegetation DSMs were added, one additional file (Vegetationdata.txt) including information of vegetation height and location are also saved. This file is also be used in the SBEB visualization plugin. Fig. 4.10 Input DSM (left) and irradiance image (right) in Gothenburg using data from 1977. This plugin is computationally intensive i.e. large grids will take a lot of time and very large grids will not be possible to use. Large grids e.g. larger than 4000000 pixels should be tiled before.